You are here: Home » New for Elizabeth’s reign – just the wrong Elizabeth! New for Elizabeth’s reign – just the wrong Elizabeth! It’s funny what people will say to sell things. And plant sellers come up with the funniest ideas of all. In the local garden centre I spied these daffodils and had to mention them, not just because of the ludicrous pack but because it is a variety I really want to add to the garden. 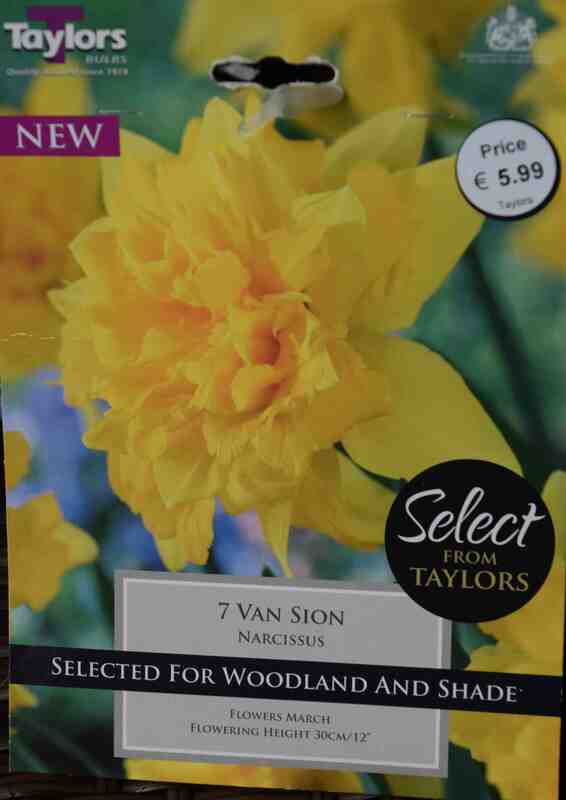 ‘Van Sion’ is one of the first daffs I knew and I grew up with it when we lived in an old Victorian vicarage where many ancient daffodils grew in various places, especially in grass and in woodland – this is one tough daff. The flowers are curious because sometimes the trumpet is entire and stuffed with petals but at other times the trumpet is split so the flower is a ragged carnation-like bloom as in the pack illustration. They are often tinged with green too but are basically a golden yellow. It is a fairly compact plant, flowering at about 30-35cm high so that, despite the fully double, rather heavy flowers, they are usually held well on the sturdy stems, unlike other doubles that are mutants of existing singles rather than bred specifically to be double. ‘Van Sion’ is a good choice for naturalising, for borders and if you like something really antique. Yes, that’s right, antique! You may have suspected that this is not as new as the pack suggests when I said I knew it as a child, but then my grandparents, and their grandparents (and so on), could have said the same. Records of this daffodil go back to 1620! It is a lot of things, but new, it ain’t. Despite this decision by Bowles, it is now more properly known as ‘Telamonius Plenus’ despite the fact that cultivar names should not be latinised. Do you see a mess developing here? Just to get it out of the way, it has also been called ‘Centifolio’, ‘De Sion’, ‘Double Van Sion’, ‘Guernsey Cabbage Daffodil’, ‘The Wilmer’s Great Double Daffodil’, ‘Van Sion’, ‘Vincent Sion’, ‘Wilmer’s Double Golden Daffodil’, ‘Wilmer’s Great Double Daffodil’, ‘Wilmot’s Double Daffodil’. All this nonsense just adds to the charm of this beautiful daffodil. Much as I love the modern daffs of perfect form and unusual colouring, I also value the old, historic kinds and this is one that is very special. I am delighted that Taylors have prepacked it for retail sales and I am chuffed that I have some. Fascinating. I wonder if we have any. All your historical snippets are fascinating…usually l steer away from these blousy new blooms…you have changed this!